Sarek National Park is one of Scandinavian’s most mythical mountain areas. An area without either overnight cabins or marked trails. True wilderness where you are completely at mercy of yourself. 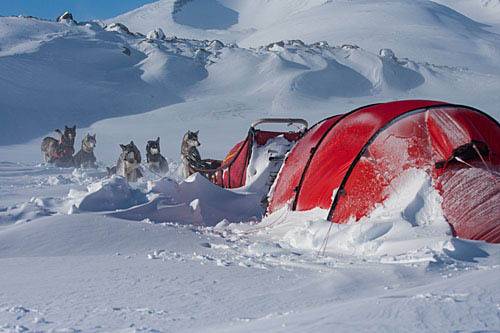 Many people dream about dogsledding in Sarek but may not feel ready for a tougher expedition tour. That’s why we made this tour with both winter camping inside the National Park and more comfortable overnights in cabins just outside Sarek’s boundaries. A perfect tour for you who wants to get a taste of what Sarek can offer combined with the Kings Trail’s comfort. The bus/transfer stops in Kebnats. This is as far as you can get with car. From here we get a ride in sleds behind a snowmobile over the ice of the Lule River. Check-in at the Mountain Station. Here you have the possibility to take a hot sauna or shorter snowshoe walks along the trails. We say hello to the huskies and eat a nice dinner in the cosy restaurant. the teams are ready for take off. dig snow walls for the tent. The area is nice for a short snowshoe walk if you like. Today we sledging further on into Sarek National Park. We cross the ravine, travel over wide open mountain expanses and if the weather is good we can enjoy a panorama over the Ähpar massive and Sarek massive, two of Swedens most coveted high mountains. This is an area with none or very few tracks and is very weather exposed so we are often entirely at mercy of ourselves. We will adapt our journey to the prevailing circumstances. Suddenly we can get an opportunity to be able to extend the ride or the weather will force us down on our knees and we must humbly bow. Another night in our tents. feel the warmth from the stove, eating our dinner in a kitchen and sleep in soft beds. valley (Rapadalen) and to set tent camp in the delta underneath the two characteristic mountains Nammatj and Skierfe. Skierfe’s vertical mountain wall of 700 m is a classical view in many books and papers referring to Swedish Lapland. If the weather is good we can take a soft and relaxing morning. Possibility to take a short snowshoe walk in the forest below Skierfe and Nammatj. Later on we harness the dogs and go east towards Aktse where a tough climb awaits us up on Aktsenjunjes. We have to work hard helping the dogs for a few kilometers but we will be rewarded with a spectacular view when we come up. In the east low mountains and woodlands billow out miles and miles towards the horizon. To the west the higher mountains of Sarek pile up to the sky. From the highest peak we will have a pleasant drive down towards Sitojaure and the cabins. We will spend another night in the warmth of the Sitojaure cabins sparkling woodstove. We start out with our dogteams after a good night sleep. Heading north following the well marked Kings Trail with open expanses and usually easy driven trails. After a while we come down to the Big Lule river (Stora Luleälven) and Saltoluokta Mountain Station where our adventure begun. Before the three course dinner in the cosy restaurant we can enjoy a shower and hot sauna. We eat breakfast together and say good bye to the dogs before leaving Saltoluokta. This tour goes partly in Sarek National Park where we are completely at the mercy of the weather gods. We try to follow our planned routes but have to adapt to current conditions. Jokkmokkguiderna interacts with the reindeer herding Sami’s in the area and we try to minimize disturbance on the reindeers and the traditions that have existed here for generations. All activities are mostly moderate but sometimes hard. In wilderness cabin we sleep on bunk beds in mixed room with both gentlemen’s and women’s. Dry toilet is available at the camps but when we camp in tent we dig a hole in the snow. The wilderness cabins are heated with wood/gas and have no electricity or running water.